Tailgating is an American tradition as old as professional sports and concerts. Whether you are a baseball, football, basketball or Rolling Stones fan, if you love to tailgate, then you know the most precious commodity is your own toilet. The first cardinal sin of tailgating is public urination, but when you’ve got to go, you’ve got to go! Many tailgaters try to take cover behind their automobiles, but this method is ill advised because there are always police present, and they are looking for this common indiscretion in order to write an easy ticket. Most stadiums provide porta-potties, but the lines to use them get very long very fast. A half-hour wait in line can be excruciating after a few beverages. The solution? Bring your own bathroom facility. Fortunately, there are options for discerning tailgate enthusiasts who do not want to wait in line. 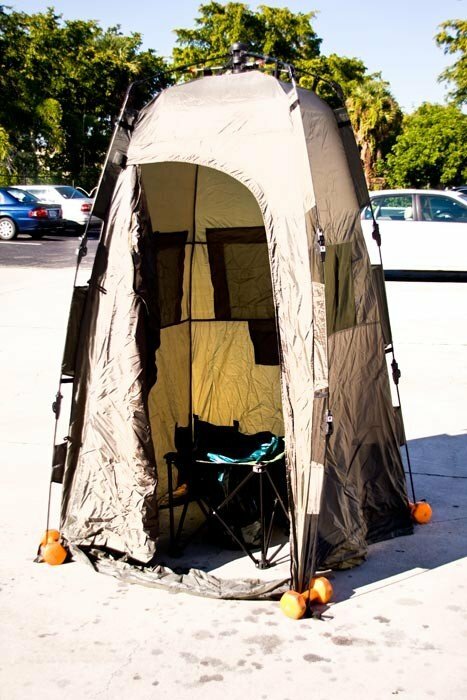 The Personal Restroom Tent by BioRelief is the perfect remedy for the porta-potty blues. The PRT is lightweight and sets up or breaks down in just a few minutes. You can now create instant privacy amidst a crowded parking lot and become the envy of your tailgating neighbors. Do you love tailgating but hate porta-potties? Are you ready to be the ultimate tailgater? Visit us now at BioRelief.com.